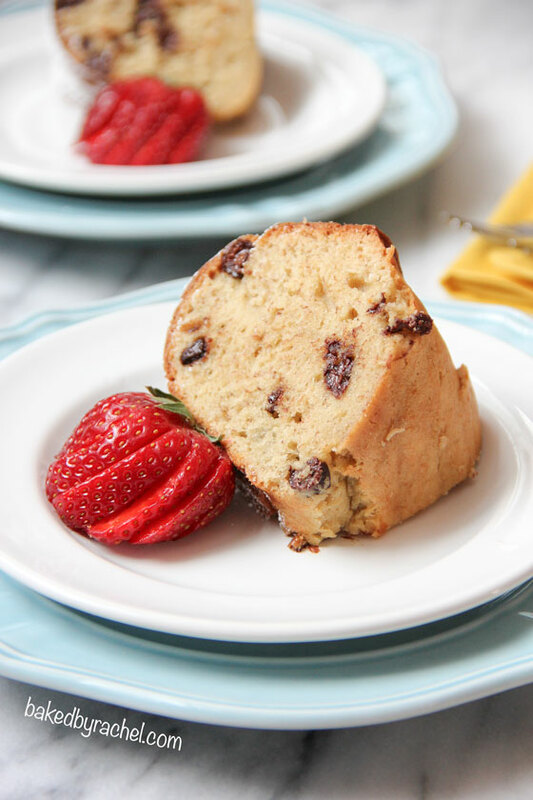 Enjoy cake for breakfast with this light and moist banana and chocolate chip bundt cake. Happy first day of spring! If you missed the news, it snowed again and several more inches beyond what that photo shows. What a way to welcome spring. I’m pretty sure we’ve had at least one storm (sometimes more!) a week for the last seven or eight weeks straight. Not even remotely joking. And 90% of those gave similar results to today’s storm or on one occasion, triple. I am completely over winter and it’s ridiculous weather. I’m also boycotting all future groundhog days from here on out because clearly the current Phil doesn’t know what he’s talking about. Let me know when there’s a new Phil in his place. So anyway… spring is here and let’s happily ring it in with cake. This here was my second attempt. The first was good, but not perfect so I didn’t feel right posting it. I want you to have success with the recipes I share, so I only post ones I know work. Finally I had a chance to fiddle with the recipe again and this time – total success! 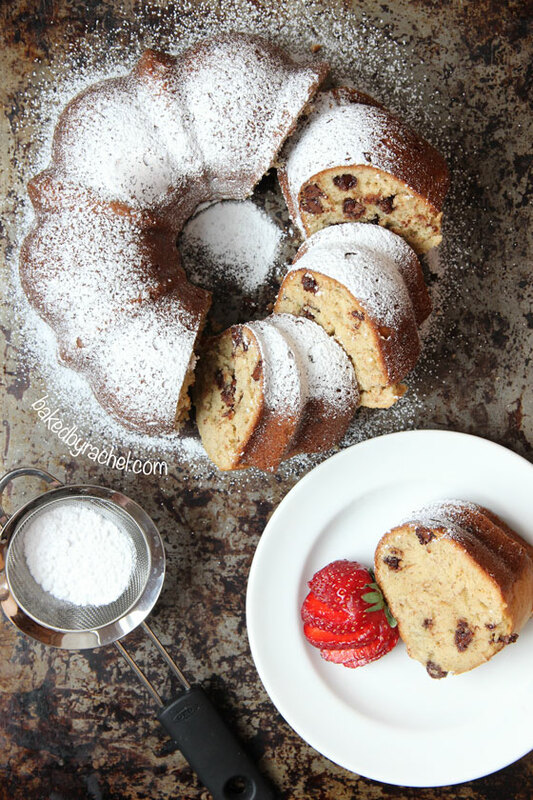 It’s the perfect banana chocolate chip bundt cake that can be enjoyed for breakfast, snack or dessert! A nice firm crust with a moist center that holds together. Pair this with some freshly sliced strawberries or maybe even some fresh whipped cream or ice cream. Eating this as is – on the go is totally acceptable to and definitely happened in this house. It’s one of those snacking cakes that you just can’t resist. One note on the recipe, I used an 8-inch bundt pan for this, which may not be the most common size but you could definitely make this in a 10-inch bundt pan as well. Be sure to watch the cake and test slightly early in case it’s done sooner. Less height may or may not require a shorter bake time. Preheat oven to 350 degrees. Grease and flour an 8-inch bundt pan well, set aside. In a large bowl or stand mixer, cream together butter and sugars. With mixer on low, add eggs and vanilla. Add banana and mix until just dispersed throughout. Add remaining dry ingredients, minus chocolate chips, mixing until smooth. Finally stir in chocolate chips. Transfer mixture to prepared bundt pan, evening out the batter as needed. Bake for 40-45 minutes or until a cake tester inserted comes out clean, exposed cake is firm and golden. Soak a kitchen towel with steaming hot water. 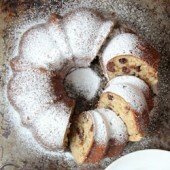 Place bundt pan on wet towel for 2-3 minutes. Using a rubber spatula, carefully check that the edges of the cake are not stuck to the sides of the pan. Place a large platter or cooling rack on top of the bundt cake, using oven mitts or dry kitchen towels, carefully invert bundt pan. Remove cake pan.